Its name comes from the circular spots that cover a chalcedony basis. It is therefore an orbicular jasper. It exists in almost any color, mainly with red, yellow, brown and pink spots. In America, there are many legends about this stone because many Pre-Hispanic cultures had the leopard as a symbol of power. A few stories tell that the world would have been founded on leopard jasper in order to show the harmonious relationship between man and the animal world, and more particularly with the leopard. It would help shamans connecting with their animal spirit or their animal totem. This stone was therefore often used in decoration and jewelry. 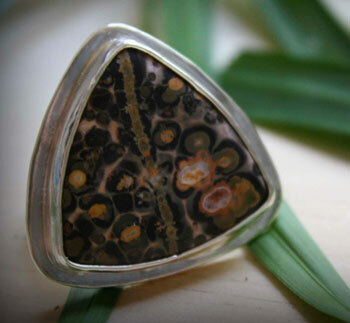 The leopard jasper would be use quite often to avoid complications while giving birth. It would be effective against skin problems, more particularly viral ones. 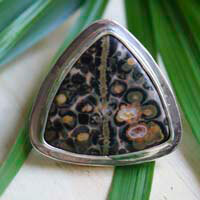 The leopard jasper also has the same general properties than the ones of the jasper.